You'll be £20.00 closer to your next £10.00 credit when you purchase Hitler's Executioner. What's this? Though little known, the name of the judge Roland Freisler is inextricably linked to the judiciary in Nazi Germany. As well as serving as the State Secretary of the Reich Ministry of Justice, he was the notorious president of the ‘People’s Court’, a man directly responsible for more than 2,200 death sentences; with almost no exceptions, cases in the ‘People’s Court’ had predetermined guilty verdicts. It was Freisler, for example, who tried three activists of the White Rose resistance movement in February 1943. Along with Christoph Probst, Sophie and Hans Scholl were arrested for their part in an anonymous leaflet and graffiti campaign which called for active opposition against the Nazi regime. Found guilty of treason, Freisler sentenced the trio to death by beheading; a sentence carried out the same day by guillotine. In August 1944, Freisler played a central role in the show trials that followed the failed attempt to assassinate Adolf Hitler on 20 July that year – a plot known more commonly as Operation Valkyrie. Many of the ringleaders were tried by Freisler in the ‘People’s Court’. The proceedings were filmed, the intention being to use the images as propaganda in newsreels. Freisler could be seen alternating between clinical interrogations of the defendants through to his yelling of personalized and theatrically enraged abuse at them from the bench. Nearly all of those found guilty were sentenced to death by hanging, the sentences being carried out within two hours of the verdicts being passed. Roland Freisler’s mastery of legal texts and dramatic court-room verbal dexterity made him the most feared judge in the Third Reich. In this in-depth examination, Helmut Ortner not only investigates the development and judgments of the Nazi tribunal, but the career of Freisler, a man who was killed in February 1945 during an Allied air raid. 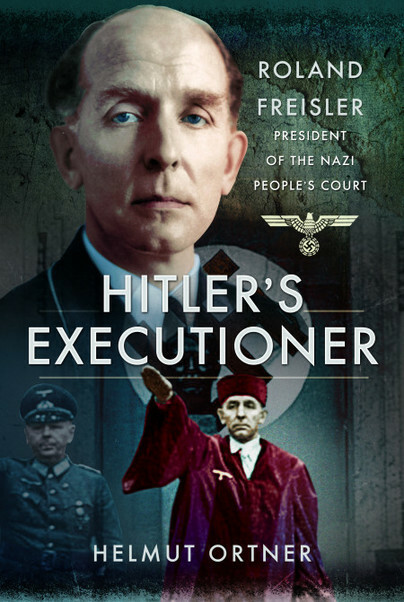 Nazi justice was extensive and deadly and Helmut Ortner considers this in Hitler’s Executioner: Roland Freisler, President of the Nazi People’s Court. Born in 1950, Helmut Ortner has written over thirty books, mostly on social topics and on issues of justice. Helmut’s previous works include The Lone Assassin, the remarkable true story of Georg Elser, a German worker who planned and carried out an elaborate, but unsuccessful, assassination attempt on Adolf Hitler and other high-ranking Nazi leaders at the Bürgerbräukeller in Munich on 8 November 1939. Helmut’s books have been translated into many languages. He lives in Frankfurt am Main, Germany.